A team of scientists including those from the University of Southampton have shed new light on the world’s history of climate change. The Pacific Ocean has remained the largest of all oceans on the planet for many million years. It covers one third of the Earth’s surface and has a mean depth of 4.2 km. Its biologically productive equatorial regions play an important role particularly to the global carbon cycle and long-term climate development. During a four-month expedition of the Integrated Ocean Drilling Programme (IODP) on board the US drilling vessel JOIDES Resolution an international team of more than 100 scientists and technicians recovered 6.3 kilometers of sediment cores from water depths between 4.3 and 5.1 km and drilled 6.3 km of sediment cores at eight locations. The cores offered an excellent archive of Earth’s history and showed how global climate development during the past 55 million years is mirrored and influenced by geochemical processes deep within the ocean. The findings are published in the latest edition of Nature. Professor Heiko Pälike, of the University of Southampton and National Oceanography Centre, Southampton was co-chief scientist of the cruise and lead author of the Nature study. Volcanoes are one major source of carbon dioxide input to the atmosphere. On the other hand the greenhouse gas is removed by weathering of rocks made up of carbonate. “The overall balance of these processes is reflected in the deep ocean’s carbonate compensation depth, the CCD,” the MARUM scientist continues. “This invisible surface is defined as the depth in the oceans at which the mineral calcite is dissolved. Hardly any biological remains made from carbonate below the CCD, for example chalk and microscopic plankton, are preserved. Instead the sediment that consists mostly of clay and plankton remains made from silica. In the study, Professor Pälike and co-workers demonstrate that in the equatorial Pacific the CCD was at 3.3 to 3.6km 55 million years ago. Between 52 and 47 million years ago, when very warm climate conditions prevailed, the CCD leveled up to 3 km. 34 million years ago, when the Earth slowly but steadily cooled and the first ice domes formed in Antarctica the CCD went down too. 10.5 million years ago it reached 4.8 km. The cores drilled during the expedition strikingly demonstrate that the interplay of climate development and carbon cycle was not a one-way street at all. 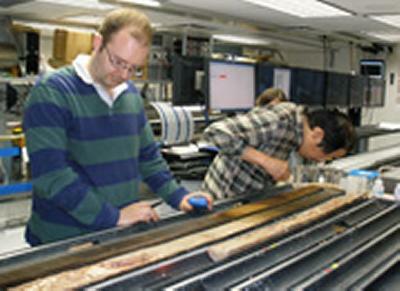 Similar episodes were registered in the sediment cores for later parts of the Earth’s history. 18.5 million years ago the CCD moved upward about 600 metres – only to sink down to 4.7 km 2.5 million years later. Today, the Pacific carbonate compensation depth is at 4.5 km. The University of Southampton team involved in the study comprised Professor Heiko Pälike, Professor Paul Wilson, Professor Eelco Rohling, Dr Steve Bohaty, Dr Gavin Foster, and Dr Kirsty Edgar. The Integrated Ocean Drilling Program (IODP) is an international research program dedicated to advancing scientific understanding of the Earth through drilling, coring, and monitoring the sub seafloor. The JOIDES Resolution is a scientific research vessel managed by the U.S. Implementing Organization of IODP (USIO). Together, Texas A&M University, Lamont-Doherty Earth Observatory of Columbia University, and the Consortium for Ocean Leadership comprise the USIO. IODP is supported by two lead agencies: the U.S. National Science Foundation (NSF) and Japan's Ministry of Education, Culture, Sports, Science, and Technology. Additional program support comes from the European Consortium for Ocean Research Drilling (ECORD), the Australia-New Zealand IODP Consortium (ANZIC), India's Ministry of Earth Sciences, the People's Republic of China (Ministry of Science and Technology), and the Korea Institute of Geoscience and Mineral Resources.